Our Research and development project has been heating up this week, with the first stage being the delivery of shadow puppetry workshops to Brixington Academy in Exmouth. We wanted to teach the pupils there a little about the techniques of making shadow puppets and using them to tell stories in a theatrical way. This also gave us an opportunity to show them a bit of our developing Ugly Duckling adaptation and to explore the wider themes of the story. It was really encouraging to see that the pupils all understood the underlying moral of the Ugly Duckling: that we should accept people for what they are and celebrate difference in others. A view of our Scratch performance at The Bike Shed, which we presented again today. We put the classes into smaller groups and helped them make their own shadow puppets to create small stories inspired by the Ugly Duckling. They were really inspired by this method of storytelling and took to the task with enthusiasm. At the end of the day all of the groups presented their work. The content of the pieces ranged from comical retellings of fairy tales, to a thought provoking and rather moving story of a soldier leaving for war. All of the pupils seemed to enjoy working with this art form and expressing themselves creatively and the staff were pleased to see their students get a chance to perform. 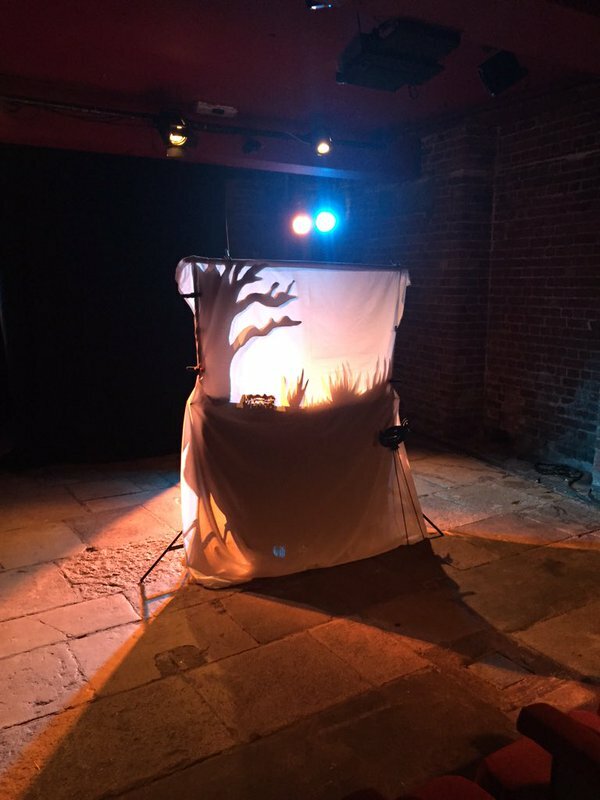 In terms of our own development and the creation of our show, we’ve seen how effective shadow puppets can be in telling stories to younger audiences and range of tones which can be expressed with this medium. Also we saw how this story can resonant with younger audiences in a mixture of ways. The group who decided to present a World War One story were inspired by the Ugly Duckling’s sense of isolation and felt that this resonated with how a soldier might feel when deciding to go to war. Many of the pieces focused on the section of the story where the ugly duckling is bullied by the other animals in the farm yard, with many groups including a hero figure that saved the duckling and accepted his difference. We’ve decided that we want to include more humour in the piece as this seemed really effective with some of the pupil’s own work and we’ve got some more ides to develop the style of our puppets. We’ll be developing the show over two weeks at Warboys Productions Theatre Farm Retreat and Exeter Bike Shed’s Unit space, but before that we have plenty of work to do on the script and the set. Thanks again to Brixington School for hosting our workshops today and to the fantastic pupils who took part.